View of Grodna, - BRAUN, G / HOGENBERG, F.
Title : View of Grodna, . Map maker : BRAUN, G / HOGENBERG, F.. Size : 16.0 x 20.3 inches. / 40.6 x 51.5 cm. 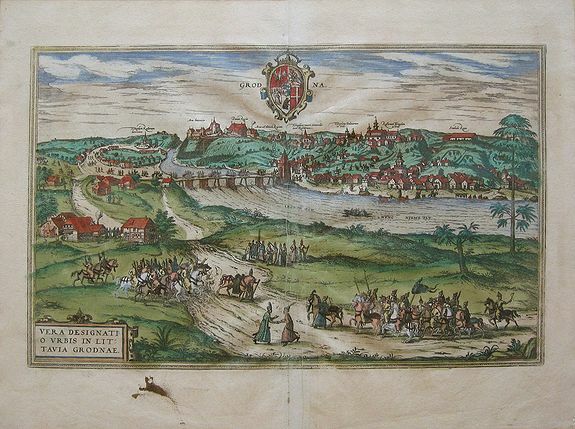 Description :This is a stunning view of what is now referred to today as Hrodna or Grodno, a city in Belarus. This image showings the city situated on the banks of the Neman River (called in this instance the "Nieme" River) with a bridge spanning its width. Buildings and chapels rest on the tops of hills, while men on horseback parade through the streets. The plates from Georg Braun and Frans Hogenberg's landmark Civitates Orbis Terrarum are the most valuable source for the study of Renaissance urban topography, and among the most evocative bird's-eye city views ever published. For the first time, the Civitates provided an extensive series of town views with the goal of rendering them in an accurate and meaningful way. Earlier collections of town views were far more limited in scope, and often made no real attempt to render cities with any degree of fidelity. These works were more often an attempt to show that cities existed than to illustrate the form they took, and they normally contained no more than a handful of views. The Civitates, by contrast, included hundreds of views, many showing smaller towns for which no earlier topographical studies are known. Even for the larger, important cities, such as Paris, the Civitates was of the utmost importance in tracing the history of their topography. This massive collection was conceived to serve as a sort of companion work to the Theatrum Orbis Terrarum, the first modern world atlas, published by Abraham Ortelius in Antwerp beginning in 1570 (indeed, Hogenberg had first-hand knowledge of that impressive and influential work, having been commissioned by Ortelius to engrave many of the plates for the maps it included). The text for the Civitates was compiled and written by Braun, the Canon of Cologne Cathedral, and a total of five hundred views were eventually included. The majority of the engraving was completed by Hogenberg and Simon Novellanus, many after drawings by Joris Hoefnagel, a talented topographical artist. For the Civitates, drawings and plans were solicited from the best artists and mapmakers from all over Europe. As a result, it took over forty years to collect the hundreds of plans contained in the folio volumes that form the complete work. Condition : Very Good. Natural aging throughout margins and waving of paper. Stain in bottom left hand corner. Printers crease along center fold.